A new football academy has been opened by the Mangaldai Sports Association for the first time in its history to groom and technically guide the young football talents. 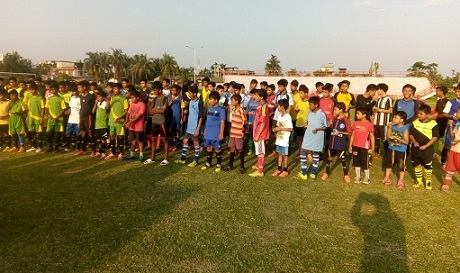 Pabitra Ram Khaund, Director of Sports, Assam, ceremonially inaugurated the academy at Mangaldai Stadium on Sunday afternoon in presence of several prominent persons and veteran sports organizers including Mangaldai MLA Gurujyoti Das, Mangaldai Sports Association Secretary Anupam Deka among others. While talking to Northeast Now, Bipul Kr Sarma, football secretary of the premier sports body expressed in Darrang district, expressed happiness at the sound response from talented kids and their parents. “On the opening day itself we have enrolled more than two hundred trainees,” said the football secretary of Mangaldai Sports Association. At the same time, the Mangaldai Sports Association also opened a new Table Tennis Academy under the supervision of a coach from the National Institute of Sports (NIS) at Mangaldai Stadium. A total of twenty budding talents have reportedly enrolled for training in the Table Tennis Academy on its inaugural day on Sunday.